We've had several holidays at Center Parcs over the past few years, but they have been mostly at Christmas time when the weather isn't particularly good. This year we decided to go to Center Parcs Sherwood forest during spring bank holiday. Whilst generally better than Christmas time it is not normally associated with particularly hot weather. This year it turned out to be a bit of a mini heatwave, so whilst this was still out of the main season it was more like a summer holiday than a typical British spring holiday. We did all the usual things that I have already written about at the other holidays. This includes our favourite part of Center Parcs which is the subtropical swimming paradise. It has the best swimming pool, which is large enough so that you are not constantly bumping into people. It has some great slides and a white water ride which, as far as I know, in the UK is unique to Center Parcs. The extra activities that were made possible by the weather, or are at least improved by the weather includes: cycling around the parc, watersports on the lake and building sandcastles on the lakeside beach. We also got to make use of the BBQ on the lodge patio. 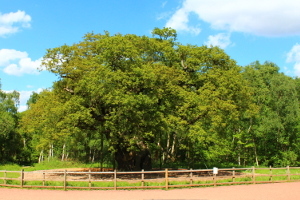 We also had a good day out visiting Sherwood forest, which was also better due to the nice weather. We have always had a good holiday at the various Center Parcs and I'd still recommend a holiday around Christmas time. It's been a long time since we had a holiday at Center Parcs during nice weather and I'd forgotten how much more there is to do. Whilst there is no guarantee of good weather in the UK whenever you take a holiday it's a great place to have a summer holiday too. See more photos on the Days Out Diary Facebook photo album.